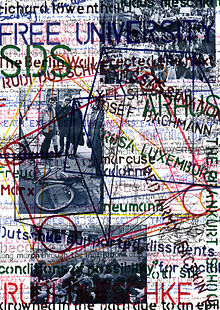 The long march through the institutions (German: der lange Marsch durch die Institutionen) is a slogan coined by student activist Rudi Dutschke to describe his strategy for establishing the conditions for revolution: subverting society by infiltrating institutions such as the professions. 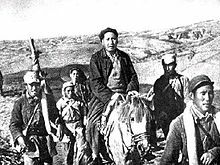 The phrase "long march" is a reference to the prolonged struggle of the Chinese communists, which included a physical Long March of their army across China. The main influence on Dutschke's thinking is commonly thought to be the work of Italian communist Antonio Gramsci who, while imprisoned by Mussolini, wrote about cultural hegemony and the need for a "war of position" to establish the conditions for a revolutionary "war of manoeuvre". Degroot also identifies Ernst Bloch as a major influence. Bloch met Dutschke at Bad Boll in 1968 and admired his integrity and determination – qualities which he had written about in Das Prinzip Hoffnung (The Principle of Hope) as being essential for the achievement of utopia. 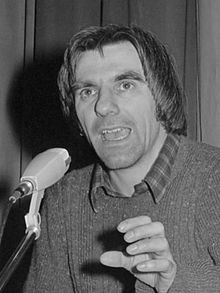 To extend the base of the student movement, Rudi Dutschke has proposed the strategy of the long march through the institutions: working against the established institutions while working within them, but not simply by 'boring from within', rather by 'doing the job', learning (how to program and read computers, how to teach at all levels of education, how to use the mass media, how to organize production, how to recognize and eschew planned obsolescence, how to design, et cetera), and at the same time preserving one's own consciousness in working with others. ^ Kimball 2001, p. 15. ^ Davidson 2006, p. 261. ^ a b Degroot 2014, p. 110. ^ Marcuse 2014, p. 336. This page was last edited on 17 December 2018, at 09:06 (UTC).